At the Y, swimming is a life skill. Our swim lessons prepare kids of all ages to stay safe and have fun in the water, building strong swimmers and confident kids. 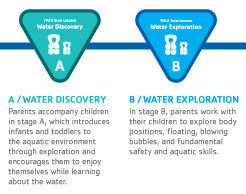 Our new swim lesson progression curriculum is geared towards what we know about how children and adults learn and develop. Students begin wi th and build upon skills they are ready to learn, helping them to celebrate their successes, build self-confidence, enjoy learning to swim, and water safety. 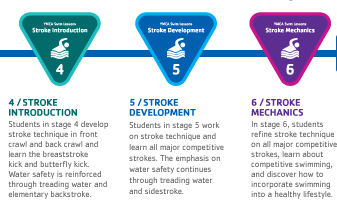 Our new swim curriculum is based on extensive research, and we look forward to seeing swimmers advance quicker through each stage. The fun fish names we previously used to identify the different levels have been replaced with names that more closely relate to the skills we will be working on in each stage. 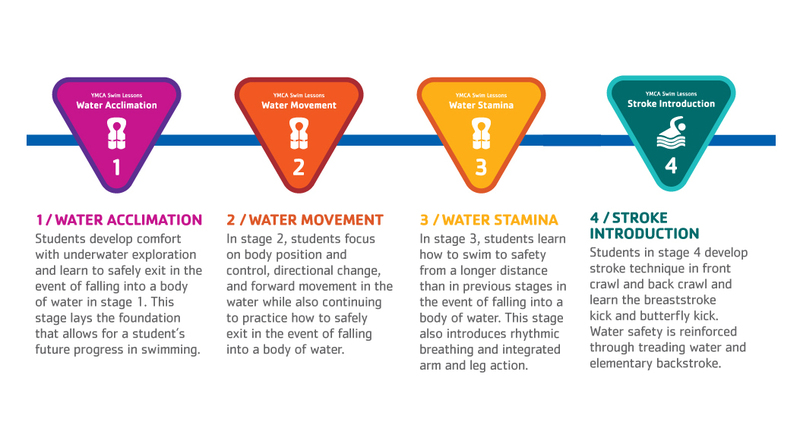 Swim lessons are now organized into three phases, and each phase includes several stages, focused on a specific skill set. 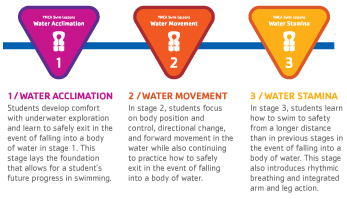 For the student, emphasis is on skill progression and water safety. Parents will now have peace of mind knowing that their child will learn self-rescue skills first, then, how to swim. As students advance, focus turns to increasing stroke coordination, comfort and endurance. Once the students have built strength and endurance, they will master familiar strokes, such as elementary backstroke, front crawl, backstroke, breaststroke, and butterfly. HOW DO I KNOW WHERE TO PLACE MY CHILD FOR SWIM LESSONS? New to Swim Lessons or Unsure of Your Child’s Level? To make swim level selection as easy as possible, please refer to the following documents. Already Know Your Child’s Swim Level? If you already know your child’s swimming level, registering for a swimming lesson is very easy! Click the REGISTER NOW buttons below that correspond to your child’s swim level. Accompanied by a parent, infants and toddlers learn to be comfortable in the water and develop swim readiness skills through fun and confidence building experiences, while parents learn about water safety, drowning prevention, and the importance of supervision. or any other type of parenting relationship. For those ages 13+ who are beginner or inexperienced swimmers. If you feel you work better in a one-on-one setting, want to work on specific skills or strokes, or would like more flexible class times, these lessons are for you. Private lessons are for individuals; semi-private lessons are for two children with one instructor. Lessons are scheduled at the same day and time for seven consecutive weeks. Competitive swimming is one of the most popular national competitive sports the Y offers. It is available at both of our branches. Competitive swimming helps kids value hard work, reach for excellence, and enjoy spirited competition in state, regional and national championships.